We started a family tradition in the last year or so to spend Friday dinners together at a restaurant. Usually we try to visit a new place, but often we have difficulty in deciding (Wes always chooses McDonald’s or Hardee’s or Steak n’ Shake), and settle on one of our favorite locations. It was a fun night out, and we had an excellent Chinese waitress. She enjoyed interacting with Wesley, and she asked him questions about his hobbies and interests. He’s very good at being receptive, and it was fun to watch. The Chinese word for “good, complete, right” (好) is a combination of the words “girl” (女) and “boy” (子). I wish I would have said something in return other than, “Is that right? How cool!” It sat funny with me. I mean, I’ve personally come a long way on this subject. I’ve turned a page and have focused on our little family of 3. I know in my heart that I’m good mom and wife, and we’re in a really, really good spot – the 3 of us. We’re close. We do a lot together. We have many experiences that neither Steven nor I ever had the chance to do as children. But I’ve always had this back-in-the-mind feeling that God’s got some bigger plan for us, and I don’t know what it is. (I try so desperately hard not to guess or jump to conclusions because I know his timing is perfect, and mine is not!) It could be as simple as loving on and supporting our nieces and nephews more, or those special kids in our kid’s life. We’ve been testing that out, and it’s so. much. fun. I find my heart’s grown 3 sizes larger since my “page-turn.” I adore the little people all around us – watching them develop intricate personalities, interests and skills. Elli, 8, has so many interests that are like me in music, art and dance. She’s doing well on piano and is starting to take guitar lessons. She is graceful in ballet and is now in hip hop. She can paint, too! I love her spontaneous spirit. Jeremiah, 6, has recently learned how to solve Rubik cubes. He solved one that stumped all of Steven’s coworkers. He has the most clever sense of humor and astounds us with his ability to absorb information. He loves LEGOs and Star Wars and has a gentle, kind demeanor. Anna, 6, has the independence and sometimes stubborn nature that defies her tender beginnings as a 3-lb preemie. She has the biggest, most alert eyes that have determination to keep up with her big sister. She is silly, fun, and she earns her nickname, Anna Banana. Josiah, 4, is a bundle of energy. He always has a smile or a mischievous grin on his face, and he constantly makes me laugh. Mom and I used to joke that he sorta resembled Dopey the dwarf as a baby, and though he’s not “dopey,” he just melts your heart like that little character does. Our nearly-nieces and nephews are just as special. Beatrice, 5, Jovia, 3, and Oliver, 1, are the best little friends Wesley’s ever had (and likely TO have), and JoJo even calls me “her good friend Leah.” Levon, 3, is an lively little boy who Wesley tries to take under his wing every time we hang out. And dear Lucian, 1, our sweet godson. We get to see him in a few months over Thanksgiving! OR it could be as simple as sponsoring a child. And that’s exactly what we’re going to do! 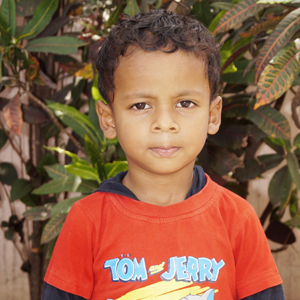 I’m pleased to introduce you to Jastin, a 5-year-old boy who lives in India. Wesley chose him to be his friend and “pseudo-brother” because of his similar age, and likely because of his cool Tom & Jerry shirt. Because this is a very new decision, we haven’t yet made contact with Jastin, but Wesley’s warming up to the idea and getting excited to be a part of his life. Wes has been asking many questions about culture, faith and climates, and it’s an opportunity to open conversations about our faith and heritage. Sponsoring a child isn’t a new experience for us. Steven and I briefly sponsored a child with a large organization when we were first married, but admittedly, we were not ready to make such a commitment. I regret that we were unable to continue supporting the child, and it’s frustrated me for years. I remember thinking that it would be a good time to revisit the commitment when we had a child of our own to keep us accountable. This relationship with Jastin is uniquely special to us because he is sponsored through Mid India Child, a ministry of our dear friends in India. 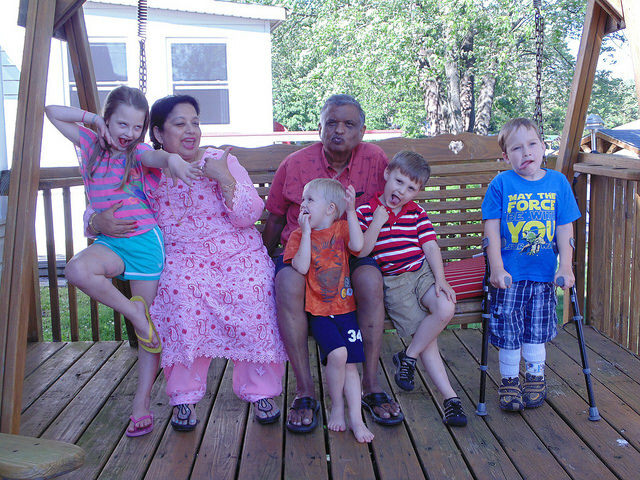 I grew up knowing missionaries David and Sheela Lall as my Indian aunt and uncle, and their three kids, similar ages to me and my sister, soon became our Indian “siblings.” My parents were their forwarding agents on the United States side of things for nearly 30 years – they are very close friends, and we’re lucky enough to see them several times a year as they travel across the globe. 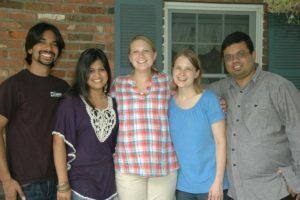 Shiny, my Indian sister, and her husband, Tommy, have taken the reigns and have formed Mid India Child as a way to link all of their central Indian ministries together under one roof through child sponsorship. They run a girls’ boarding school and a special-needs school for abandoned children, provide school and community supplies to villages and slums and college scholarships. Other ministries within the extended Lall family include film production, an orphanage, Bible college, eye hospital, church planting, boys’ vocational school, and many other things I often forget to mention! So, while we don’t have a girl to “complete” the Shattuck family, we already feel complete. And now that Jastin’s a small part of our small family, I feel just a little bit more proud and full. Good and complete! So, get ready, Jastin. You’re now part of a small American family who wants to do big(ger) things and make an impact. We love the people who will directly help you through Mid India Child, and we love you, too.